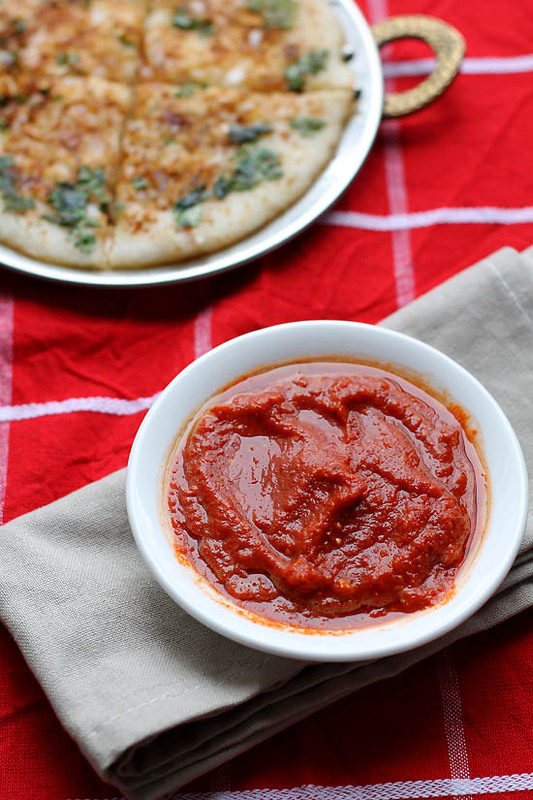 Tomato Chilli Chutney recipe is a easy recipe which goes well with dosa, appams, vada pav, pakoras, chats, pizzas or as a side dish. This chutney recipe is my mom’s recipe. The taste of this chutney is spicy, tangy and delicious. We ate this with uttapams and dosas loved the taste of it. This is the quickest chutney I have made merely from 5 ingredients. You don’t need to temper this chutney. Also you could make in advance and store them in the fridge should last for 2 days. Main ingredients for this chutney are dry kashmiri red chilies, tomatoes and garlic. If you aren’t fond of spice then add less of chilies and more of tomatoes. I am in love with the deep color with dark orange hues of this chutney. Probably this one of my most shortest and quickest post. I love anything made quickly and easily. Doesn’t matter how long or short of time it takes to make a recipe but it should be healthy and delicious. You could check some more chutney recipes on my blog like tomato-onion chutney, coconut peanut chutney, red coconut chutney, green chutney, chat chutney, dry peanut powder chutney, sesame chutney and bombay duck chutney. Tomato Chilli chutney is the quickest chutney made merely from 5 ingredients. Main ingredients for this chutney are dry kashmiri red chilies, tomatoes and garlic. Soak the dry red kashmiri chilies for 20-30 mins. Discard the water. Combine all the ingredients and grind them until smooth. Add little water if required but no too much. Scrape and remove the chutney into a serving bowl. 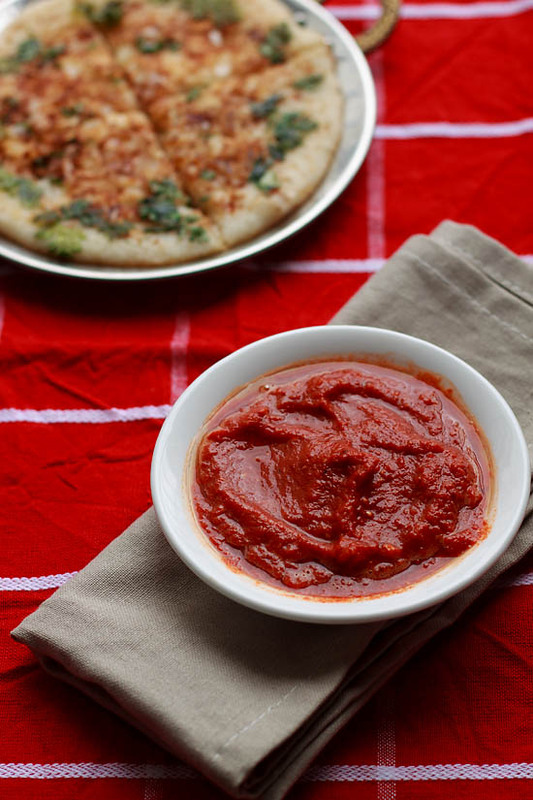 Serve tomato red chilli chutney with dosa, pakoras or as a side dish. 1. Add less red chilies if you don't like too hot. You could also add more tomatoes. 2. If you wish you could temper the chutney but it's not required.